NASA's Terra satellite captured an image of Typhoon Doksuri as it made landfall in eastern Vietnam in the Ha Tinh province. The Moderate Resolution Imaging Spectroradiometer or MODIS instrument that flies aboard NASA's Aqua satellite passed over Typhoon Doksuri as it was making landfall in northeastern Vietnam on Sept. 14, 2017. The image showed Doksuri's eastern quadrant over Vietnam, Laos, and eastern Thailand. The southernmost bands of the storm were over northern Cambodia. The eastern quadrant extended into the Gulf of Tonkin. On Sept. 15 at 5 a.m. EDT (0900 UTC), Doksuri had already completed the landfall of its center of circulation. It was centered near 17.9 degrees north latitude and 106.0 degrees east longitude, about 174 miles northwest of Da Nang, Vietnam. Doksuri was a typhoon when it made landfall and was still a typhoon with maximum sustained winds near 80 knots. It was moving to the west at 12 knots. 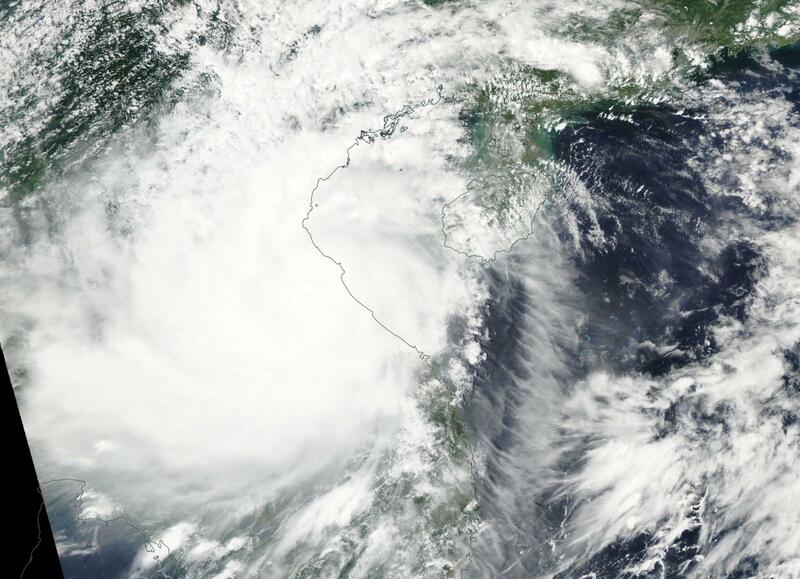 The Vietnam National Centre for Hydro-meteorological Forecasting (NCHF) continued the tropical storm warning on Sept. 15 as the Doksuri continued to weaken and move further inland.